In my day, you were lucky if you had some broken Clackers and a half-sucked, flocculent gobstopper in your trouser pockets. But here I am, half a century later, watching a swarm of school pupils running around the playground with entire computers attached to them. Or microcontrollers, at least. This was Eastlea Community School’s Technology Day, and Steph and I had been invited along by ICT and computing teacher Mr Richards, a long-term Raspberry Pi forum member and Pi enthusiast. The day was a whole school activity, involving 930 pupils and 100 staff, showcasing how computing and technology can be used across the curriculum. In the playground, PE students had designed and coded micro:bits to measure all manner of sporting metrics. In physics, they were investigating g-forces. In the ICT and computing rooms, whole cohorts were learning to code. This was really innovative stuff. 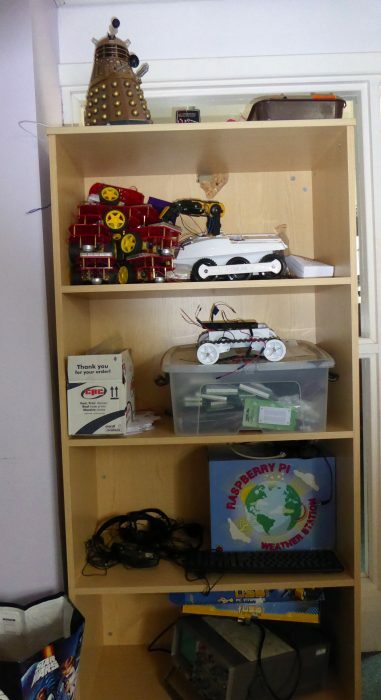 A highlight of the tour was Mr Richard’s classroom, stuffed with electronics, robots, and hacking goodness, and pupils coming and going. It was a really creative space. 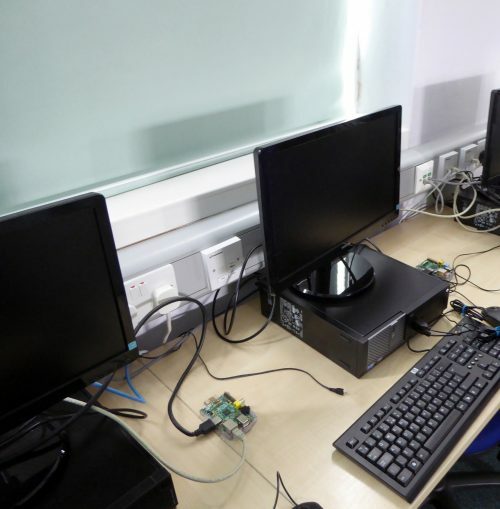 Impressively, there are Raspberry Pis permanently installed on every desk, which is just how we envisaged it: a normal classroom tool for digital making. All this was amazing, and certainly the most impressive cross-curricular use of computing I’ve seen in a school. But having lived and breathed the Raspberry Pi Oracle weather station project for several months, I was really keen to see what they’d done with theirs. And it was a corker. 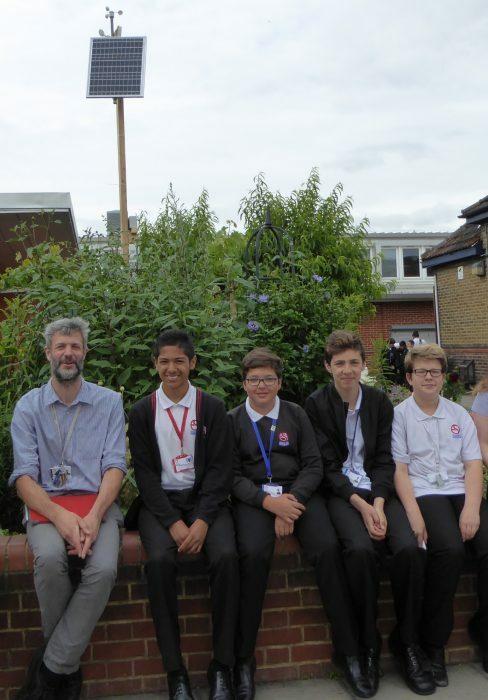 Students from the computing club had built and set up the station in their lunch breaks, and installed it in a small garden area. Then they had hacked it, adding a solar panel, battery and WiFi. This gets round the problems of how to power the station and how to transfer data. The standard way is Power over Ethernet, which uses the same cable for power and data, but this is not always the optimal solution, depending on location. It’s not as simple as sticking a solar panel on a stick either. What happens when it’s cloudy? Will the battery recharge in winter? Mr Richards and his students have spent a lot of time investigating such questions, and it’s exactly the sort of problem-solving and engineering that we want to encourage. Also, we love hacking. Not content with these achievements, they plan to add a camera to monitor wildlife and vegetation, perhaps tying it in with the weather data. They’re also hoping to install another weather station elsewhere, so that they can compare the data and investigate the school microclimate in more detail. The weather station itself will be used for teaching and learning this September. 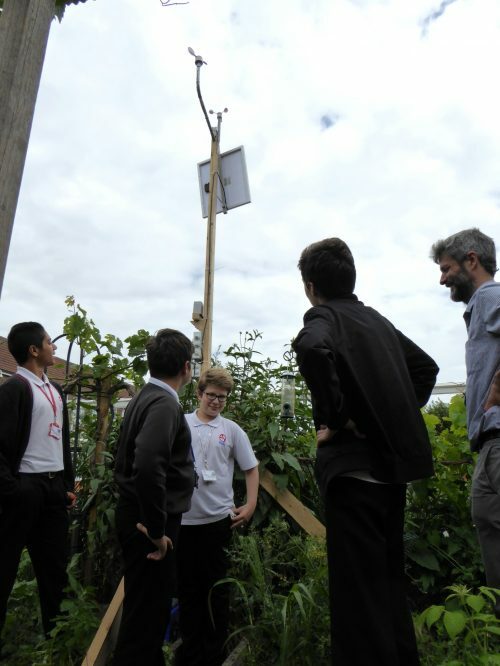 Eastlea Community School’s weather station really is a showcase for the project, and we’d like to thank Mr Richards and his students for working so hard on it. If you want to learn more about solar panels and other hacks, then head over to our weather station forum. The remaining weather station kits have started shipping to schools this week! We sent an email out recently for people to confirm delivery addresses, and if you’ve done this you should have yours soon. If you were offered a weather station last year and have not had an email from us in the last few weeks (early July), then please contact us immediately at [email protected]. Is Eastlea an all-boys school? Eastlea is a comprehensive school for girls and boys. Although there are no girls in this particular story, girls are well represented in computing. We have a good uptake in GCSE Computer Science from both sexes. Eastlea is a school for boys and girls and their tech day was for everyone! It was brilliant to see such a range of people with excited faces throughout the school – every teacher and young person took part, inspiration was bouncing off the walls! As Steve said, the group of students who showed particular interest in building the weather station happened to be a group of lads – but the data and its legacy will be for the whole school to enjoy! The addition of the solar panel and camera were great ideas – incredible work being done by students.